There was a time when everyone thought records were dead. The aging and suddenly cumbersome technology was seemingly left for obsessive collectors or those just clinging to nostalgia. 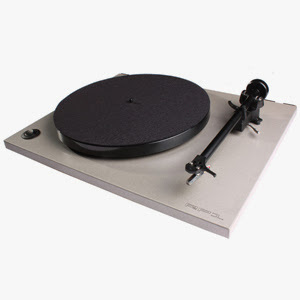 But vinyl sales have been growing, jumping 33 percent in 2009 over the previous year, according to Nielsen SoundScan, and younger pop stars have embraced the format - Justin Timberlake saying he likes the sound better, and Taylor Swift releasing her latest album, Speak Now, on vinyl. 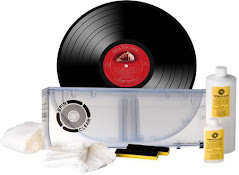 The 2.5 million vinyl units is still just a tiny piece of the 1.5 billion units sold, but the audience for records appears to be growing, even locally. A new music store opened in New London over the summer, The Telegraph, featuring new and used vinyl, run by music promoter Rich Martin and his wife, musician Daphne Martin. "I learned from Mystic Disc back in the day," Martin says. "(Owner) Dan Curland had always railed against CDs... I thought he was just an old curmudgeon." But Martin quickly became a vinyl devotee. "Viscerally it's much warmer and a better way to go," he says. "Everybody's got their own ear for it… you feel it around you more. On digital, the sound dissipates quicker, it's more treble-y." Tara Wyatt, the owner of Niantic's record store, Tumbleweeds, loves the vintage sound quality, "the crackle and pop," which she says younger people can appreciate from inheriting their parents' collections. Though Martin still sells (and owns) CDs, Martin believes they made music less valuable and more disposable. "A plastic CD feels like a piece of trash. I have a bag of them in the back of my car and they kinda get wet sometimes," he says. In contrast, you can still find records from the '40s in great shape that have retained their value, he says. A record, Martin says, is simply "more engaging by its nature." "Instead of throwing it in and forgetting about it, or putting your iTunes on shuffle... you're there with the record," Martin says. "You listen to it halfway through and then flip it over. You're thinking about it and talking about it." Wyatt agrees that records are a more social way of listening to music. "I have an entire room in my house that's all vinyl," she says. "You can connect with the artist and how the process took place." Of course, older technology is much more limited. You can't carry it with you or listen in the car. But record companies have helped vinyl advance by including free download codes in albums so listeners can enjoy music in both formats. 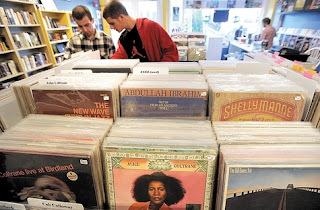 Two out of every three vinyl albums sold, according to Nielsen, were purchased at an independent music store. The Telegraph boasts more than 5,000 records, about one-third of which are new. Although the store has an indie vibe - most recently advertising new albums by Fleet Foxes, Belle & Sebastian and Deerhunter - Martin tries to cater to all types of music lovers. He carries music from crooners to motown to classical to country, in addition to the local music scene, along with record players. He has a John Coltrane album that collectors would value at $300 to $500, and, he says with a smile, "We have some Toto records I'll sell ya for two bucks." There's also a certain pleasure in browsing the racks and checking out the album art, lyrics and liner notes. Karrie Bulger, who helps out in Martin's store, says she recently heard someone on NPR reminiscing about the artwork on a Flaming Lips album grabbing them, even though they didn't know anything about the band. "They wonder, 'Does that happen anymore? Do a lot of the kids even know what an album looks like?' It's such a tangible thing. It's romantic to buy an album and read all the stuff that comes along with it," she says. Martin actually didn't set out to open a music store. He needed office space for his small record label and came up with the idea when landlord Frank McLaughlin suggested a retail side. But what he now values is the museum-like atmosphere record stores manage to retain. "You talk about everybody's personal experience, when they first heard a song, when they saw them live," he says. He hopes it can also be a new place for musicians to find inspiration, he says. Congratulations to Deanna, the first emailer! She wins a $100 gift certificate to CSN Stores!! Look for more contests coming very soon! 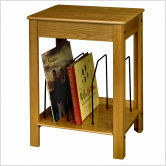 Tired of storing your record player on that old end table? You can use this $100 to get a better stand. Be the first person to email me with the word 'end table' in the subject line and you win a $100 gift certificate to CSN Stores! DEAR JERRY: My late brother was a teenager in the 1960s, and among his things are many records from those days. Most are plainly marked and obvious as to what they are, except for one mysterious item, a picture sleeve with no record inside. This plain white paper sleeve has a pencil drawing, credited to Ted Sully, of Davy Jones. This is the same young man who was a member of the Monkees. The only other print reads "Davy Jones Presents" (presents what, we're not told), and "Davy Jones Record Co., New York & Beverly Hills." My online searches for "Davy Jones and Ted Sully" came up with nothing. —Pauline Mason, Santa Ana, Calif.
DEAR PAULINE: Can't say exactly which, but we are certain it is one of four. The fledgling label's executive vice-president was industry veteran, Jack Angel, co-founder of the Herald label. Among his more successful Herald artists are: Mello-Kings ("Tonite, Tonite"); Nutmegs ("Story Untold"); Faye Adams ("Shake a Hand"); Maurice Williams & the Zodiacs ("Stay"); and Turbans ("When You Dance"). Staying with what he knew best, in one of the company's first press releases, Angel says: "We're sticking to R&B-oriented and Pop-R&B music, mostly by newly-discovered talent." The same Ted Sully drawing of Davy, and text you see on the sleeve, is also used as the company logo on the record labels — peculiar because Jones is not heard on the songs, and there are no images of those who are. 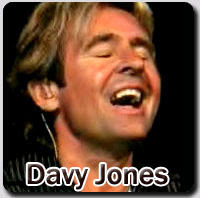 As a tie-in when launching their new label, 50 of the nation's top radio stations ran a "Weekend with Davy Jones" contest, with listeners submitting their responses to "Why Davy Jones is Your Favorite Monkee." The 50 winners, one from each radio market, were treated to dinner and a recording session with Davy Jones in Los Angeles, and other fun stuff. Each teen winner was accompanied by the parent or guardian of their choice. IZ ZAT SO? Davy Jones, the first member chosen to be a Monkee, must have liked "Gypsy Girl," an obscure 1966 release by the Staccatos (Syncro 661). One of the most successful recording artists of the pre-Beatles era, Lonnie Donegan, died in 2002 mid-way through a UK tour and shortly before he was due to perform at a memorial concert for George Harrison with The Rolling Stones (age 71). Donegan who launched the skiffle craze in the UK had the 1959 hit "Does Your Chewing Gum Lose Its Flavour On The Bedpost Over Night", the 1960 UK #1 single "My Old Man's A Dustman," "Rock Island Line," plus over 30 other UK Top 40 singles. In 1956, Elvis Presley's "Love Me Tender" took over the top spot on the Billboard chart, pushing his double sided hit "Don't Be Cruel"/"Hound Dog" to number two. In 1957, Sun Records released "Great Balls of Fire" by Jerry Lee Lewis. It will be his biggest hit, reaching number two on the Billboard Pop chart, number three on the R&B and number one on the Country and Western chart. The single went on to sell over five million copies worldwide. ABC-Paramount released Danny and The Juniors' first hit, "At the Hop" in 1957. The song sold 7,000 copies in and around Philadelphia when it was first issued on the small independent Singular label. Elvis Presley had his fifth UK No.1 single in 1960 with "It's Now Or Never," it stayed at #1 for eight weeks. The song which was based on the Italian song, "O Sole Mio," gave Presley his first post-army #1. In 1962 a song called "He's A Rebel" topped the Billboard Hot 100, credited to The Crystals. In reality, the song was recorded by a trio known as the Blossoms, featuring lead singer Darlene Love. Phil Spector had hastily put the song together while The Crystals were out of town and put their name on the label because they had already had two top twenty hits with "There's No Other" and "Uptown." During a Rolling Stones North American tour in 1964, a 17 year-old Rolling Stones fan fell from the balcony during a gig in Cleveland, Ohio. The Mayor of Ohio banned all future pop concerts, saying; "Such group's do not add to the community's culture or entertainment." The filming for The Beatles Magical Mystery Tour was completed in 1967, finishing with a sequence at Ringo's country house in Weybridge, Surrey. BBC television bought the rights to broadcast the film twice, the first broadcast, in black-and-white was scheduled for December 26, 1967. The second showing, on the color channel BBC2, was not yet available to all Britons, was set for January 5, 1968. Pink Floyd make their US debut at the Winterland Ballroom in San Francisco in 1967. The tour will come to an early end when Syd Barrett displays increasingly strange behavior, refusing to lip sync to "Arnold Layne" on American Bandstand and refusing to answer questions on The Pat Boone Show. Carly Simon and James Taylor married in 1972. During a concert at the Empire Pool in London in 1977, Elton John announces that he will not tour anymore. He would stay retired for fifteen months, but on February 3, 1979, he will resume touring with a concert in Sweden. One hit wonder M went to #1 on the US singles chart in 1979 with "Pop Muzik." The Eagles started a nine-week run at #1 on the US album chart in 1979 with 'The Long Run', the group's fourth US #1 album. RCA records signed Latin teen sensations Menudo for $30m in 1983. The line up of five young boys all had to sign a contract agreeing to leave the group when they reached 16, (when too old for the group). Ricky Martin was once a member. Billy Ocean started a two week run at #1 on the US singles chart in 1984 with "Caribbean Queen" (the song was originally called "European Queen"). In 1990, 25 years after their version was recorded, The Righteous Brothers went to #1 on the UK singles chart with "Unchained Melody." The track had been featured in the Patrick Swayze film 'Ghost.' Written by Alex North and Hy Zaret, "Unchained Melody" is one of the most recorded songs of the 20th century, with over 500 versions in hundreds of different languages. In 1990, "Ice Ice Baby," by Vanilla Ice became the first rap record to top the US singles chart. The track was initially released as the B-side to the rapper's cover of "Play That Funky Music," and became the A-side after US DJ's started playing the track. A free concert was held in Golden Gate Park in San Francisco in 1991 to honor the memory of promoter Bill Graham, who was killed in a helicopter crash the week before. Crosby, Stills, Nash and Young, The Grateful Dead, Journey and Joan Baez were the featured acts. "Keep The Faith" by Bon Jovi was released in 1992. It was their first album in 5 years. In 1995, Hootie and the Blowfish reach an out of court settlement with Bob Dylan for the group's unauthorized use of Dylan's lyrics in their song "Only Want To Be With You." In 1997, Metallica came to a out of court agreement with a fan who claimed he lost his sense of smell after being dropped on his head by fans at one of their shows four years earlier. The live Bee Gees album "One Night Only" was released in 1998. EMI Records announced they had dropped Simple Minds in 2000. The Scottish band had sold over 30m albums during the 1980's. Eminem started a 12 week run at #1 on the US singles chart in 2002 with "Lose Yourself." Santana were at #1 on the US alum chart in 2002 with ‘Shaman’ their fourth US #1 album. In 2003, P Diddy ran in the New York City Marathon and raised $2,000,000 for the educational system for the children of New York. He finished the marathon in four hours and eighteen minutes. Awesome! Winners at this years 2005 MTV Europe awards included Coldplay, who won best UK act and best song for "Speed Of Sound," Green Day won best rock act and best album, Alicia Keys was named best R&B act, System of a Down won best alternative act, The Black Eyed Peas won the best pop award and for the first time, the awards included a category for best African act, won by 2 Face. Madonna, in her first live TV performance since a riding accident, launched the show by emerging from a giant disco ball. Madonna also presented MTV's 'Free Your Mind' humanitarian award to Live 8 organiser Bob Geldof. In 2006, a man who had been stalking US singer, actress Hilary Duff was arrested for threatening to kill her. According to legal papers, Maksim Miakovsky had gone to the U.S. "for the sole purpose of meeting and becoming romantically involved with Ms. Duff". He was later sentenced to 117 days in jail and five years probation after pleading no contest to the charges. Also in 2006, former Beatle Paul McCartney presented the live debut of his classical album, 'Ecce Cor Meum (Behold My Heart),' a four-part oratorio, at London's Royal Albert Hall. The special concert features the same ensemble that appears on the disc. In 2008, Neil Young addressed the Dreamforce conference in San Francisco. He tells the audience that his experimental, energy-efficient Linc Volt car is an example of what independent automotive innovation can accomplish. "Guys in garages around the world have come together, and this is one of the results," says the musician. The release of a remastered “Bleach” celebrated the 20th anniversary of the Nirvana album in 2009. It’s available on two formats - an expanded CD and a double-vinyl LP. Part of the package is a previously unreleased ’90 Portland, OR, concert. In addition, “The Live At Reading” CD/DVD, chronicling the band's ‘92 headlining show in England, is out. Sanctioned by surviving Nirvana members Dave Grohl and Krist Novoselic, the DVD has the band's entire Reading set in remastered in 5.1 Surround Sound, plus never-before-seen bonus footage.